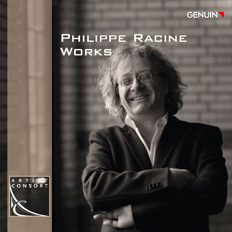 New Music relieved of all earthly weight, in thrilling prismatic colors, performed by leading musicians: this is what listeners can anticipate in this major new release of works by Swiss composer and flutist Philippe Racine on a two CD set on the GENUIN classics label. The wide range of his musical output is captured on disc: from “Poème de l'Usure” in a recording with the fantastic Collegium Novum Zürich, to the expansive violin concerto with the great violinist Raphael Oleg, all the way to chamber-music gems which bring the production to a close. A world all its own, sojourns through spirit and time: works by one of the outstanding musician-composers of our day!